I am going to let everyone in a little secret of ours: This office is addicted to Cupcakes. This is said not to discriminate against all the other wonderful chocolate treats, candies, and sweets that are frequent visitors to our tummies, because we do love almost anything made of sugar, but like all New York girls these days we have a special affinity towards cupcakes. Of course, we don’t make a living off of eating cupcakes (although that would be awesome), we make a living off working in the jewelry and accessory industry, which I categorize as art, since fashion is wearable art. Yes, you should use this as a rational when you are purchasing $400 shoes! So, imagine my glee when I see the two worlds combined in the beautifully solid glass cupcakes by Hulet & Hulet Art Glass Confections. With glass pieces that will make your mouth water, and your desk a little more interesting, these are some sweets worth checking out. What makes these glass treats even more special is they are all produced by a three women team (sisters Patty and Dinah and Robin, Dinah’s daughter), with no assistants or employees. As small companies, many of us can recognize the great feat here. I congratulate them on being able to see the fruits of their labor - or should I say chocolate’s of their labor?! - and I hope everyone takes a look at the collections of hand done glass chocolates, cupcakes, and chocolate drops. Warning: Do not try to eat cupcakes. I know they look yummy, but they are glass. Keep away from women craving chocolate, and do not store on desk if you have a sweet tooth. Chocoholics can see the full collection at www.malmseys.com. High Fashion, or High Art? 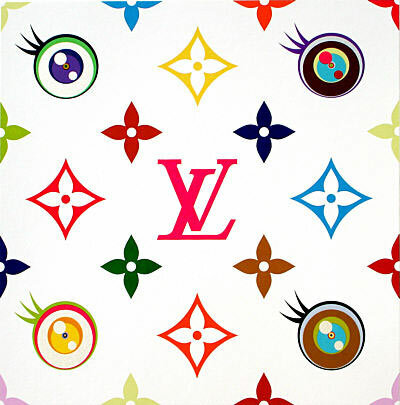 The beloved brighter-than-life artist and part time designer of Louis Vuitton handbags, Takashi Murakami has teamed up again with mega fashion designer Marc Jacobs to bring his new collection to life at the Museum of Contemporary Art in Los Angeles. Though the exhibit features over 90 works that span Murakami's career, the biggest buzz is all about....the bags?! The focal point of the exhibit is a 1,000 square foot Louis Vuitton store located inside the museum selling limited edition handbags. Collaborating with Marc Jacobs, Murakami brings his signature cute-and-colorful designs to the the store in small quantities for $960 a pop. Murakami's designs are straightforward enough, but his influence on the world has most certainly changed the way we view pop culture, art and commerce. To read more, check out the article in the New York Times.